Claude Monet – one of the famous artists of the 19th century. Many consider him the founder of the direction in painting – impressionism. The artist, with his family, lives in Arzhantey, he paints his wife Camilla a lot. One of these works, written in 1875, is the painting “The Walk. A lady with an umbrella “, she is also known as” Camila Monet with her son Jean. ” The painting depicts the first wife Monet with his eldest son Jean. This work is the most famous of the early works of impressionism Monet. The artist depicted his wife standing on a hillock, against a blue sky with running snow-white clouds. She is wearing a light blue dress, and in her hands is a summer umbrella. Everything around is flooded with bright sunshine, which means that the weather in the picture is rather hot. Beautiful woman and little baby, as if dissolved in the rays of sunlight. Little Jean is standing a little apart in the picture, and therefore, the viewers focus on Camille, so airy and beautiful. Her hair, dress skirt and kerchief develop in a light wind, and from the clouds running across the sky, the impression of airiness of the entire space of the canvas is created, enhancing its dynamism. The gaze of a young woman is a little surprised, as if, seeing the artist, she is a little embarrassed that she was caught in a blunder. But she is not in a hurry to leave, since curiosity overcomes her. 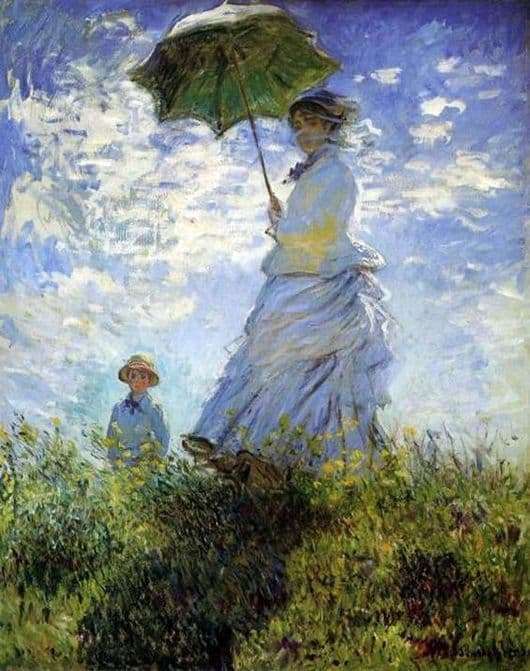 Monet did not focus on nature, only portrayed under their feet the unearthly beauty of the creature, a green meadow and at the top of the tree branch, under which Camille stands. The earth united with the sky celebrates the triumph of nature. A little boy is standing at a distance, as an outside observer with curiosity. The painting “Walk” is very positive and bright, radiating happiness and love, and at the same time conveying something unearthly that lies behind the clouds running into the distance and the blue sky. The artist managed to convey and connect together the unearthly with the earthly, eternity with ordinary life. After 4 years, after creating this picture, Camilla will die from tuberculosis, but her image on the canvas will remain forever blooming and young, giving joy to everyone looking at the picture. The painting is kept in Washington at the National Gallery of Art. but her image on the canvas will remain forever blooming and young, giving joy to everyone looking at the picture. The painting is kept in Washington at the National Gallery of Art. but her image on the canvas will remain forever blooming and young, giving joy to everyone looking at the picture. The painting is kept in Washington at the National Gallery of Art.